Have you ever wanted to take a peek inside a factory that makes insulin? It might be an interesting tour, but Factory Tours USA does not list such a tour among those people can visit. This is known, in industry parlance, as a "fill and finish" facility (I wrote in January that Biodel, Inc. had built just such a facility in Danbury, Connecticut). The primary differences are the size of the bioreactors in each facility. These can range in size from as little as 15 liters to 8,500 liters or more. Shown below are the bioreactors at India's Biocon, Ltd., which currently has FDA-approval to manufacture synthetic insulin in the U.S., although the company has yet to take advantage of that approval, as they do not currently manufacture insulin being sold in the U.S. today. Perhaps once biogenerics ("follow-on" protein drugs as the FDA likes to call them) the company will take advantage of their FDA-approval. They won't be alone, as Israeli generics giant Teva is getting into injectable drugs, too. Yesterday, it was announced that Teva received FDA approval on its Abbreviated New Drug Application (ANDA) to market epoprostenol, the first generic version of GlaxoSmithKline's Flolan, an injectable drug for intravenous treatment of primary pulmonary hypertension. Regardless, the basic manufacturing technology is the same regardless of where the facilities are located, or who makes the drug (unless, of course, they are one of the few players who still make insulin the old-fashioned way, and these companies are limited to Wockhardt U.K. Ltd., Laboratorios Beta S.A., Polfa Tarchomin S.A. or Wanbang Biopharma Ltd.). 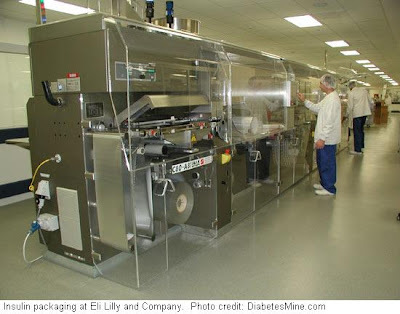 I would note that in reference to the only U.S.-based insulin manufacturer, Eli Lilly and Company, on April 16, 2008, the company announced it would be closing its last remaining Indianapolis insulin manufacturing facility which made Humalog and Humulin insulin varieties. The company will transfer production to its more modern facility in Puerto Rico (largely because of the huge tax benefits drug companies get for operating there), France (mainly for insulin cartridges), and will most likely outsource any additional capacity it needs to Hospira, Inc.'s facility in McPherson, Kansas. This is a loss that Colonel Eli Lilly himself would probably not be very thrilled to see happen. But on the upside, I recently read that Lilly is now working to develop a long-acting insulin analog of its own similar to Lantus or Levemir. This was eluded to in a recent Indianapolis Star article describing how Lilly was "returning to its roots" in diabetes care, but I said it would take more than some fancy insulin pens to turn that business around. You may recall that in my letter to then-CEO Sidney Taurel, I identified a number of things the company needed to do, one of which was to sell a long-acting insulin product if they want to remain a viable player in the insulin market, otherwise insurers find it easier to deal with rivals. But its worth noting that an article published a while back in the Indianapolis Star claimed that Lilly Labs had already previously attempted to develop its own long-acting analog, but they reported that the company was "unable to develop a comparable product to Lantus." Apparently, its back to the drawing board, but maybe this time the company won't starve the research budget for this critical business line! While it sometimes appears that biotechnology is a wave of the future, its interesting to note that perhaps sometime in the not-too-distant future, costly bioreactors could someday become a thing of the past, too, at least when it comes to making insulin. As I reported in my 2007 annual review, researchers have developed not one, but several different ways to have the complicated cellular work done by plants and animals, including lettuce, safflowers, and even in cow's milk. These methods could substantially reduce the production costs for making synthetic insulin. One of the biggest myths of using biotechnology to manufacture insulin was that it would substantially reduce the cost of insulin. That never happened in spite of those promises. In fact, the International Diabetes Federation conducted a study on the cost of insulin, and found that the cost of synthetic human insulin is significantly more expensive than the equally-as-effective (at least according to a number of meta-analyses which have studied the issue) older stuff. In essence, the big savings went to the shareholders of the insulin manufacturers, not patients or their healthcare providers. But Canada-based SemBioSys believes its product would require about $80-million in capital investment to make 1,000 kg of insulin, compared with $250-million per 1,000 kg for traditional synthetically-manufactured insulin. This could potentially reduce capital costs compared to existing insulin manufacturing by up to 70%, and product costs by 40% or more. While it remains to be seen whether these promises are delivered on, but we do know that the curtain has been lifted on the technology and processes. Maybe sometime we'll finally see less costly varieties emerge if Congress gets around to passing legislation on biogenerics/biosimilars. Its worth mentioning that the patents on the first approved insulin analog, Humalog, expires in just 4 years, so this issue should be of interest to anyone who uses insulin -- regardless of the type. Tag! You're it! Visit our blog to find out! ..............so long as Insulin is not made in China(the country where because of their obsession with "$$ before safety," has resulted in the deaths of many pets and people here in the USA and Europe) to be exported to the U.S. This applies to the recent contamination that was found in Heparin exported from China to the USA, resulting in 81 deaths. The FDA and FBI feel that this incident might have been "intentional." The deaths associated with last years contaminated pet food manufacturing that used other sources than protein to satisfy label demands of content. The deaths and illness in South America resulting from contaminated toothpaste also exported from China. In addition, the lead(in paints) that was found on many baby toys exported to the USA where because of the baby's/infants proclivity to place objects in their mouths(sensual learning, teething, oral gratification) exposed them to lead poisoning. I am not employed by Teva. I do not get the point. What do you really want to say? That recombinant DNA insulin is worthless? That the US give up production? The benefits of recombinant biosynthetic insulin have been relatively few, and the downsides to an estimated 10% of patients who have severe adverse reactions to it have been conveniently (for industry) swept under the rug. I would stop short of calling it worthless, but the reality is the benefits have been very few.